He couldn't stop crying — until he made a friend. The first day of school can be scary, especially when you don't know any of your classmates. 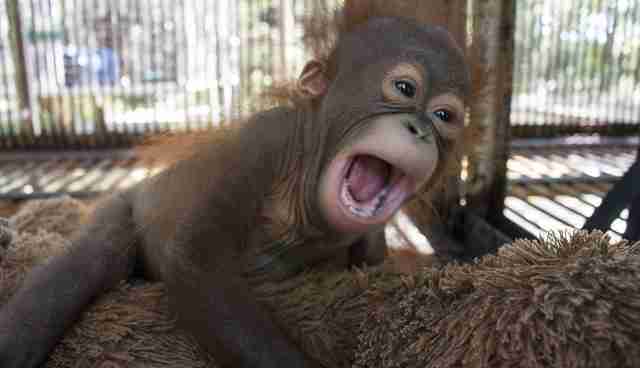 And for a baby orangutan named Gatot, his first day was no exception. According to one Indonesian man, he was searching for firewood in the forest recently near Jelai Hulu, Ketapang in West Kalimantan, Indonesia, when he heard an animal crying. He followed the cries and stumbled upon Gatot, who was just a teeny, red-furred baby. It's unclear if the man's story is true. 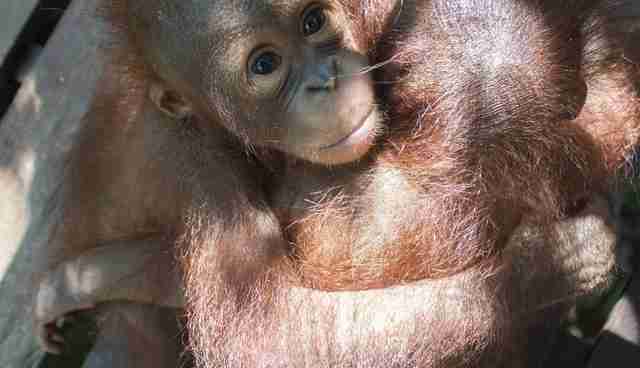 It's unheard of for mother orangutans to abandon their babies - mothers will stay with their young until they're 7 or 8 years old - so it was pretty clear that Gatot had been orphaned. While no one knows exactly what happened to Gatot, it's likely that villagers killed his mother while cutting down their rainforest habitat for palm oil plantations. The man took Gatot home with him, treating him like a human baby and feeding him milk from a bottle. While this might seem "sweet," keeping orangutans as pets is illegal - and harmful to the animal; they can develop psychological disorders and suffer from malnutrition, along with other issues. 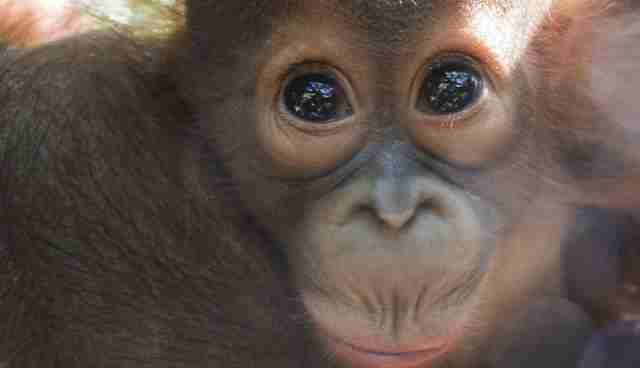 Borean orangutans have also recently been listed as critically endangered, with habitat loss and hunting being two of the biggest contributing factors driving the species to extinction. 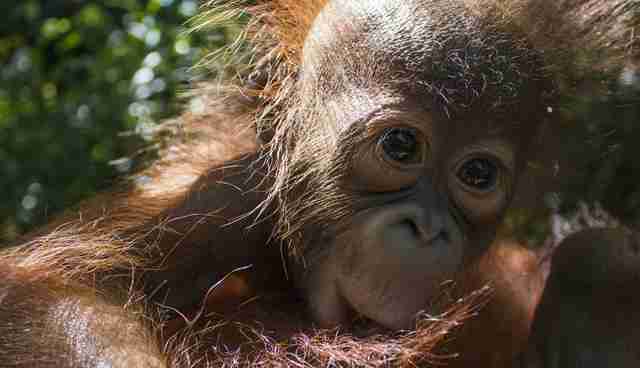 Anytime an orangutan is taken out of its habitat, there's a detrimental effect to the entire species. Luckily for Gatot, authorities found out about the man keeping him as a pet, and alerted International Animal Rescue (IAR) to come rescue the baby. 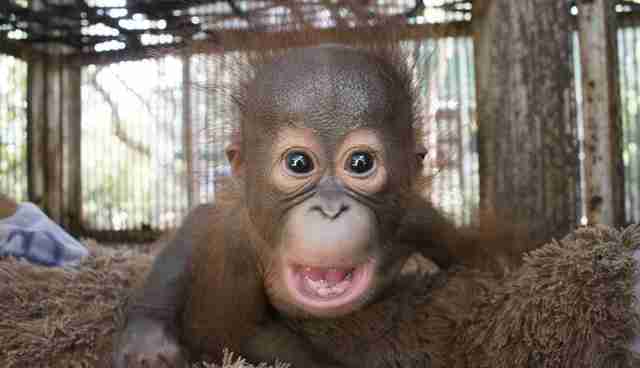 According to IAR's Facebook page, Gatot is the smallest and youngest orangutan currently in the group's care. After giving him medical treatment, the IAR team knew the best thing for Gatot was for him to socialize with other orangutans, and to learn the climbing and foraging skills that would help him go back to the wild someday. On his first day of school, IAR vet nurse Fitri carried Gatot up a ladder to meet his classmates. 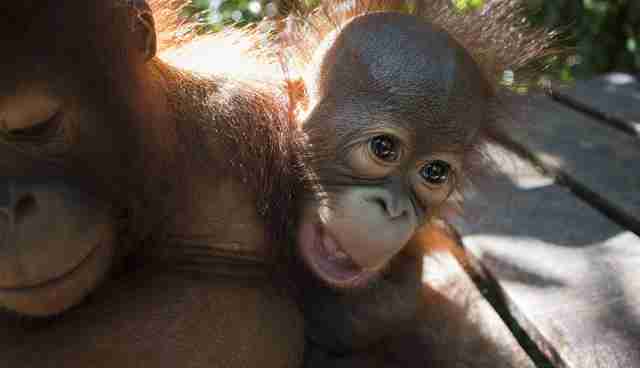 But Gatot was scared and frightened - he cried and clung to Kandi, another orphaned orangutan. ... but Kandi wasn't too sure about Gatot. After all, Gatot was making a lot of noise. 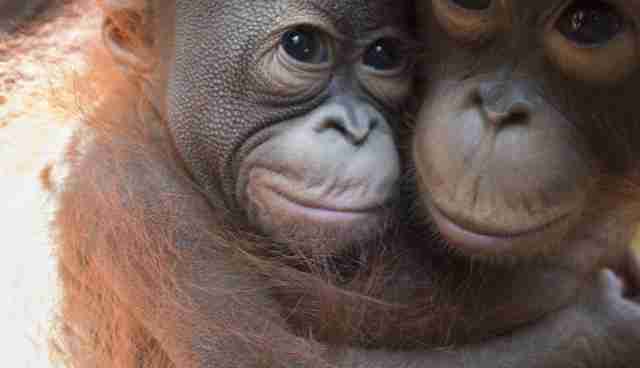 Then Gatot grabbed onto Jamila, a slightly older female orangutan. Unlike Kandi, she seemed quite happy to hug Gatot and help him through his first-day jitters. 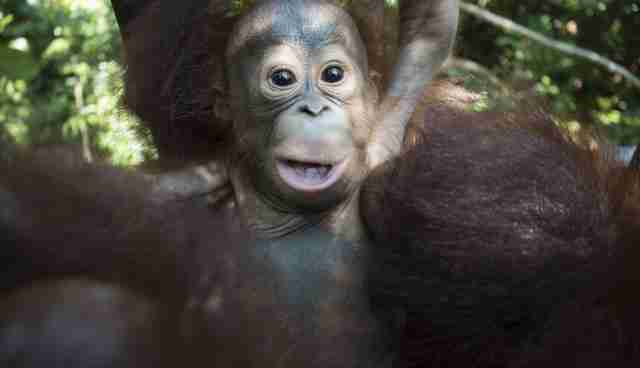 With the help of his new friends, Gatot should do well in school, and he'll learn everything he needs to know about being a wild orangutan. 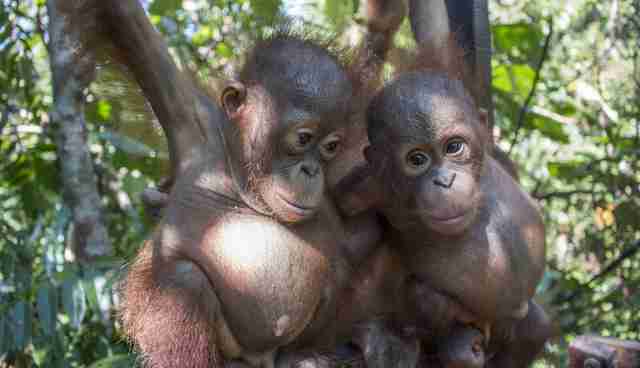 "The first day at any school is tough and it is heartbreaking to see little Gatot seeking comfort from the other orangutans around him," Alan Knight, CEO of IAR, said in a statement. "However it is among his own kind that he will learn the behaviors and the skills he will need to prepare him for life back in the wild. I've no doubt that he will soon adapt to his new environment and start to grow in confidence." 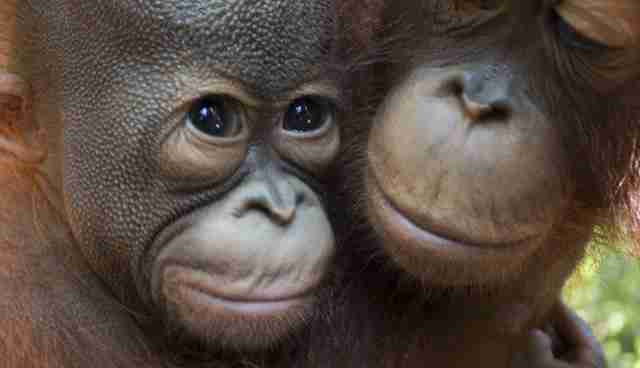 To help IAR give Gatot and other orphaned orangutans round-the-clock care, you can donate here. You can also sign this pledge not to consume any products containing palm oil, which have a devastating effect on Indonesian wildlife.